Navigation of Records in VB.Net and MYSQL Server Database. In this article I am going to show you how you can navigate from one record to another in MYSQL database table in VB.Net. In addition of that I will also show you how to search a particular record in the Database Table in VB.Net and MYSQL Server. In the previous article I show you an example of Data Binding in VB.Net and MYSQL with Loading of Records in the TextBoxes on a VB.Net Form.In addition to Adding new records, I show you how to Delete and update records in VB.Net and MYSQL Server Database. In this article I am going to show you how you can Navigate from one record to another in MYSQL database table using VB.Net. 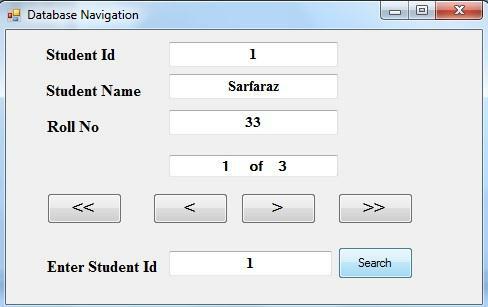 Also we design an interface in VB.Net form as shown in the picture. In the code window of the form write the code as under but first of all you need to add a reference of MYSQL.Data in your project. First Click on Project then on Project properties then click on reference finally click on Add button and select MYSQL.Data. This procedure is used to intialise a new instance of the DataSet object and DataView objects. This procedure will actually bind the controls on your form to your DataView object. This procedure will actually display the current record position on your form. Thank You, So... So... So... Much!! !